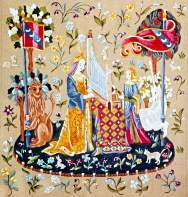 The Unicorn's Garden and The lady to the Unicorn from Cluny Museum. Annie Bouquet Hand painted Cartoon on canvas. The series of "The Lady to the Unicorn" was gived to his wife by "de Le Viste". 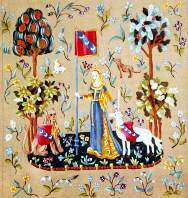 It would have order to weave these tapestries in the honor of its Lady Claude Le Viste, widow of Geoffroy of Balzac. Five tapestries represent the fives feel (taste, touch, Sight, hearing and Smell) the sixth represents the Desire. To the breadth of these representations is revealed with a lot nobility and distinction charms the stately life.